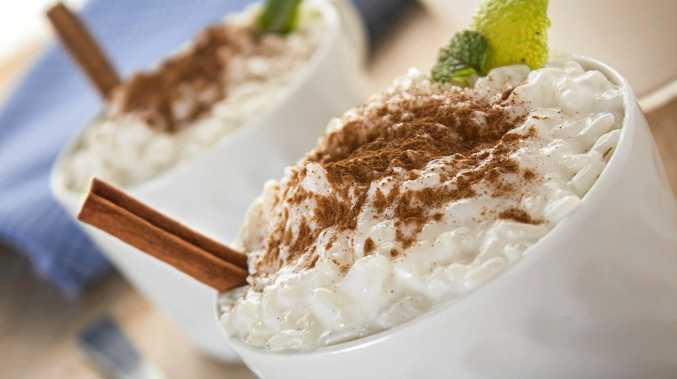 THERE'S something incredibly comforting about a good rice pudding, particularly in the winter months. Over the past few years I have crossed to the Dark Side, so to speak, and been making this childhood favourite with black glutinous rice and coconut milk for an Asian-inspired hit of vegan yumminess. But this week, with friends coming for dinner amid howling windstorms and chilly temperatures (and being all out of black rice in my pantry) I embraced my inner dag and made the version my mum used to make. Medium or short-grain rice works best for this dessert. Try calrose, sushi or Arborio varieties, as long-grain rice won't give you the creamy texture you need. You can flavour rice pudding with dried fruit and a touch of cinnamon or nutmeg, and it's delicious with vanilla stirred through. When buying vanilla, avoid the imitation essence if you can. The real deal is a little more expensive, but you don't need much and it lasts well in the pantry after opening. METHOD: Place rice in a medium saucepan and add boiling water to 1cm above the level of the rice. Bring to the boil, cover and reduce heat to very low; steam rice until all water is absorbed and rice is tender, about 15 minutes. While rice is cooking, combine 1 1/4 cups of the milk with the sugar and salt. Heat on low until hot, then add the rice and cook, stirring gently, until creamy - about 15 minutes. Stir through remaining milk, egg and sultanas and cook for a further two minutes, stirring gently. Remove from heat and stir through vanilla and butter. Divide into four bowls or cups and sprinkle with cinnamon or nutmeg.